For all the smoothie recipes below, simply put the ingredients in a blender and blend away. Add more or less ice to achieve your desired consistency. 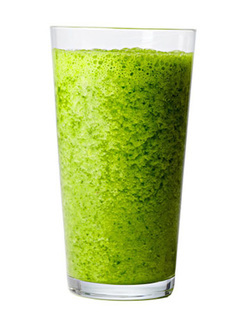 This smoothie recipe gives you a nice blend of fruit and some nutrient packed kale. I promise you won’t even taste the kale in the recipe and it’s an awesome way of getting greens in your breakfast. I absolutely love this recipe. To me it’s like eating dessert for breakfast! This smoothie recipe is unique and when figs are in season and in abundance at our grocery stores in Canada I buy a bunch and freeze them. When they are frozen the smoothie has a beautiful creamy consistency.